The team competed in a live restaurant situation creating a full dining experience for four guests and a team of judges. The theme of the competition was Latin American Cuisine and the guest judge was Robert Ortiz from the Michelin Starred Lima in London. The winning team will embark on study tour of Colombia later this year. The winning team from North Warwickshire & Hinckley College are Caitlan Holland, Dean Burnham and Callum Wood. The team was mentored by lecturers Jason Thacker and Jon Starns. 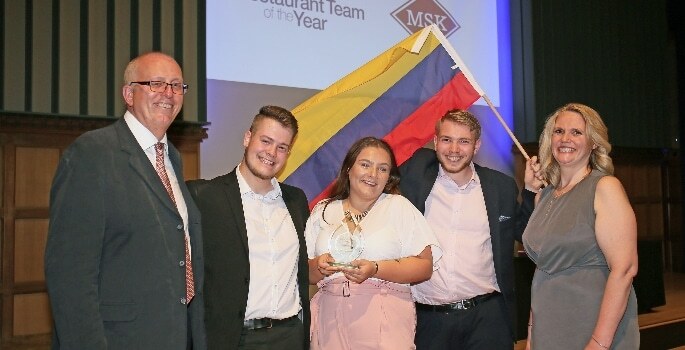 The award and prize is sponsored by MSK Ingredients and the trophy was presented at the Gala Dinner by Vicky Enderson. During the tour the team will visit Granja Luker one of the few cocoa research centres in the world owned by Casa Luker. In addition the team will explore Coffee Plantations and Latin American Cuisine. The North Warwickshire and Hinckley College team also picked up the Ignite for Innovation Awards sponsored by Welbilt and Best Service sponsored by HK Projects. Other awards presented on the evening included; Best Use of Koppert Cress, won by Kendal College, Best Menu, sponsored by Genius Foods, won by Colette’s at the Grove Hotel, Best Use of Chocolate, sponsored by Casa Luker, won by Fischer’s at Baslow Hall, and The Barista of the Year, sponsored by Cafeology, won by James Charlesworth from Loughborough College.